Fresh off the boat! 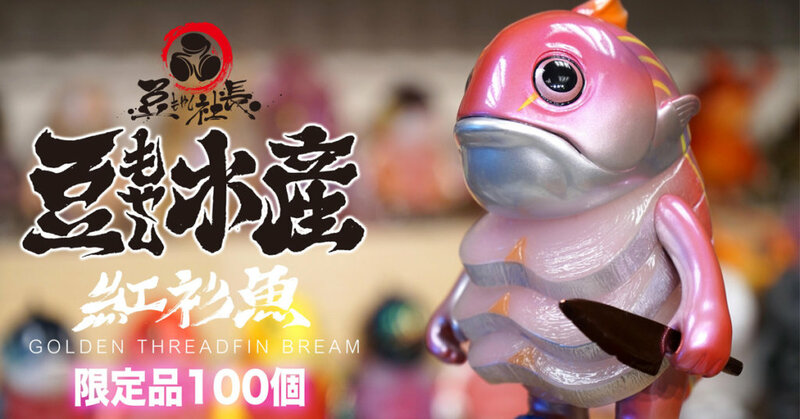 latest serving from Chino Lam x Mame Moyashi as they prepare the deal of the day Golden Threadfin Bream edition of the Senpai. The Designer Toy Award winner kicking off 2019 with a limited edition at the notorious and famous Ladies Market in Mong Kok Hong Kong as a pop-up street market. First 50 only on 6th January 2019 (Sunday) at 2 PM ON THE WOMAN STREET POP-up store, to purchase first-Come-First-served, sold out Stop. 2: the other 50 will only be purchased in a sample form, and the time location is to be announced again! For now, check out our Mame Moyashi × INSTINCTOY GIANT MAGURO 1st color “Killer whale” UNBOXING below. Follow Chino on his artist page HERE. Find Mame Moyashi on Facebook.